I hope you glean some insight after reading these Early Childhood articles! I update this page regularly, so come back often! I post excellent tips and solutions for common discipline challenges for your toddler or pre-schooler! In addition, feel free to visit my Blottblog - (just click on the tab at the top of this page) - I post blogs addressing the most common issues discussed in my classes. If you don't find the topic you are looking for, please let me know! You can email me at brandilott@blottcom.com. Shake people's hands and look into their eyes. Say "thank you" when complimented. Say "goodbye" and wish people well. I'm constantly amazed at how many parents fail to expect these things out of their preschoolers. Instead, their children are allowed to snub others or to hide behind their parents' backs. Now, I understand that some children are extremely shy. I also understand that this takes work and can feel a bit awkward from time to time. In our book, Love and Logic Magic for Early Childhood, we teach the importance of having high expectations for our children. Parents who maintain high expectations raise far happier and more socially skilled kids. Toddler tantrums are a fact of life when you’ve got a one-, two-, or three-year-old in the house. Why? Put yourself in your sweetie’s little shoes. It can be really frustrating to be unable to say what you mean or watch your carefully built block tower topple because your hands aren’t steady. And while there are dozens of reasons why your munchkin might melt down, some are directly related to things you can fix. Obviously, if your toddler is hungry, offer him a snack. If he’s tired, put him down for a nap. But if he’s clearly just blowing off steam, it’s time to resort to trickier tactics to stop temper tantrums. 1. Yuk It Up Method: See a toddler tantrum coming on? Quick, Mom tame that tantrum with fun - by doing something silly! Your darling won’t stand still for a diaper change? Put the (clean) diaper on your head. He refuses to drink his milk? Pick up a banana and make a phone call. He’s losing it for no apparent reason? Climb under the table with a book. Whoever heard of Mommy reading under the table? Why it works: Laughter releases all sorts of feel-good chemicals in the brain and stifles the stress-causing ones. The best thing about getting a toddler to giggle is that it’s not all that hard. Tots find the unexpected especially funny, so doing something outside the usual routine will more often than not distract yours long enough to diffuse his tantrum. Why it works: As soon as your toddler realizes you’re talking, he’ll probably quiet down to try to figure out why you’re using your library voice. Just make sure to be saying something soothing: “As soon as you calm down, Mommy will help you find the missing puzzle piece,” or “I’m sorry you’re so mad. Why don’t we go for a walk?” Don’t rely on this trick too often though. Your child will eventually be on to your wily, whispery ways. 3. Give Him the Cold Shoulder Method: The next time you’re face-to-face with a toddler tantrum, try ignoring the frantic antics and carry on with what you’re doing — you can even hum or sing loudly so he really gets the message. As long as he isn’t doing anything that could be harmful to his surroundings (throwing toys) or himself (running toward the street), this can be a highly effective way to stop temper tantrums. Why it works: Much of the drama may be a bit of an act. Yes, your toddler is legitimately frustrated, but at the same time, he also knows that when he cries or fusses he’ll be tended to: So he may use that knowledge as an attention-getting device. By now you know your child like the back of your hand, so don’t ignore him if he’s feeling especially sensitive or is going through a stressful time (his new baby sib is taking up most of your attention). Why it works: Basically, saying the same words over and over will bore the tantrum out of him. The trick is to be as consistent (don’t change any of the words) and as calm as possible. Keep your voice even and your face neutral. He’ll understand that you mean business, and see that he can’t get a rise — or a cookie — out of you before dinner. 5. 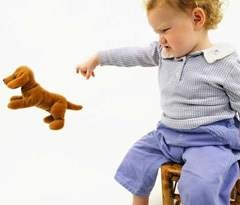 Get Your Game On Method: As soon as you see that temper start to rise, try to engage your wee whiner in a toddler game. That doesn’t have to mean dragging out Candy Land, but rather distracting him with a simple activity like I Spy, which works great in places like the DMV, airport, or any other place where waiting is involved. Why it works: Playing a game works on two levels. First of all, it’s a fun distraction. Whatever is bugging your babe will likely take a backseat to the chance to have some fun with Mommy. Which is the second point: Often a tantrum is as much a cry for attention as it is a response to being frustrated or bored or angry or tired. Just be warned — timing is everything: This method works best to put the brake on a toddler tantrum if you use it just as your cutie starts to lose composure. If you wait until he’s having a full-blown screaming fit, it’ll be too tough to calm him down to play. 6. Hold On Method: Pick him up and hug him firmly but gently. The journey to bedtime bliss starts with renaming bedtime. Kids need to think of this time as “bedroom time.” It’s a time for them to be in their rooms, but not necessarily with their eyes closed. Wise parents never try to control the uncontrollable. “You get in your bed and go to sleep, right now!” creates a power struggle over something parents cannot control. A skillful child can keep a parent engaged with this argument for hours. There is magic in choices. They speak directly to the human need for control and can produce amazing results. Be sure to offer choices you like. Never give one choice you like and one you don’t. The kids are given no more than 10 seconds to make their decisions. If it takes longer, make the decision for them. Kids become quick decision-makers when they know their parents will be making the decision for them if they don’t act quickly. Some children like to negotiate in the face of choices. Resist the temptation to argue or reason at this time. Use Love and Logic® arguing neutralizers, such as “I love you too much to argue about that, maybe you’ll like tomorrow’s choices better.” Repeat this phrase as often as necessary without sarcasm or anger. Remember there is nothing more contagious than a yawn. Experiment with yawning and acting sleepy during story time. It’s great fun to watch the drooping eyelids. Give these Love and Logic® tips a try, and join thousands of parents who enjoy peaceful evenings with their kids! Why Childhood Fits Are Fantastic Fits are great! Yep! Despite popular parental opinion, childhood fits are fantastic. Some of the worst behaved kids…and adults…grow up in homes where their parents bend over backwards to make sure that they are never inconvenienced, bored, disappointed or upset in any way. What such well-meaning parents fail to understand is that they are just postponing their children’s fits until less opportune times. After studying families for decades, we at Love and Logic believe that all children are born with a set allotment of fits that must be used up within their lifetime. As you know, some tykes are born with far more fits than others! When fits aren’t used up during childhood, they get postponed for later. Do you know an adult who probably didn’t have enough fits when they were a child? You can train your child to hear you the first time you say something. Or, you can train them to ignore you. Raising a child who listens to adults is a source of joy. Raising one who doesn’t is a constant source of frustration and torment. Our actions either train kids to listen or not to listen. Consider this situation I witnessed in an airport recently. Joshua, a five-year-old, was running out into the concourse. “Joshua. You stop that running!” called his mother. She did not follow through, so Joshua continued dashing in and out of a crowed of irritated travelers. “Joshua. You get over here!” Once more, she barked an order, but did nothing to enforce it. Of course he was right. His mother had trained him to know that she would bark orders, but never enforce them. Why should he listen if he could do as he pleased — without adult interference — by not listening? In fact, Joshua never had to walk back to his mother in the airport. She came over to him, held his hand, and apologized to me with, “I’m so sorry. You know how five-year-olds are. They won’t listen to a thing you say.” It took a lot to keep me from saying, “I’ve known a lot of five-year-olds who listen to their parents. But their parents mean what they say." 1. Make a commitment she will never repeat herself. Kids unconsciously learn how many times each parent will repeat a request before taking action. She can give Joshua the gift of knowing she will only say something once. 3. She should never accept, “But I didn’t hear you,” as an excuse. When confronted with this excuse, she should respond with, “How sad not to be listening. Maybe your ears will get better.” It is important she says this without sarcasm and follows through with the consequences of not listening. 4. Be prepared for Joshua to have a fit about not getting his way. Even though this will be uncomfortable, other adults around her will secretly applaud her courage and willingness to put forth the efforts to raise a well-behaved child. 5. Get ready to enjoy a more responsible and happier child. I have worked with kids and families for 47 years. During that time I have never met a child who failed to hear a parent’s promise. They always hear promises the first time. I’ve also learned their ears work the same way for requests when parents learn and follow the four steps I’ve outlined. Training and expecting kids to listen is one of a parent’s greatest gifts. It’s the Love and Logic way. Is Blinky giving you nightmares? We all know him. We've all laughed at his antics in spite of ourselves. We've also become frustrated and wished he would knock it off. He's the class clown. Doesn't there seem to be one in every class, and in just about every family? In my house, we have a dinner table clown. What can adults do when the clown disrupts and takes away from our valuable time, energy, and sanity? Teachers tend to agree that the most common driver of clown antics is attention. In the Love and Logic® approach, we might refer to this as the need to be noticed. This need is perfectly legitimate. Unfortunately, clowns aren't meeting it in an appropriate way. Isn't it amazing how the best teachers make kids feel important and special before the kids seek out negative attention? In our book, Teaching with Love and Logic, we encourage teachers to approach students and quietly say things like, "I noticed that you really like cars," and then move away. If the student questions their intent, we encourage them to say, "I just noticed that," and continue walking. When students want to talk about their interests, we teach educators to view this as a wise investment of time. A small amount of listening can go a long way toward decreasing the amount of disruptive clown behavior. The key, of course, is to focus on noticing things that are important to kids, not us. Will our classrooms and homes be calmer, more productive places if we invest a bit more time in noticing other’s strengths and interests? There's only one way to find out. Experiment! After investing some time noticing your beloved clown, be ready with a smile the next time disruptive behavior starts. Lean close and say something like "Will you save that for later? Thanks." and move on without missing a beat. With this skill, many teachers and parents have found their class clowns needing fewer redirections over time. OUCH! One mother wrote us about how her two-year-old had mastered the sneak attack. Just when all seemed well, he'd chomp down on the nearest piece of flesh and bear down like a bulldog. Her initial response could not be categorized as "Love and Logic," particularly when it was her own skin he was munching. His eyes lit up like Christmas morning every time she screamed, "Stop it! Cut it out! Don't bite!" After studying our Early Childhood Package she and her husband decided to run an experiment: Every time he bit them, they'd do their best to calmly sing, "Uh oh" and gently buckle him into his high chair or stroller. They didn't let him out before he was calm Of course, he wasn't impressed with this approach. He cried, screamed, begged and even tried to bite them from a distance. As soon as he calmed down, they'd give him a kiss on the cheek and let him out. Mom was proud to report that the little guy was starting to curb his cannibalistic cravings. Staying calm and providing a meaningful consequence really seemed to be the key! Have you ever noticed that parenting "experts" are everywhere? The worst is when new parents bring home infants! Friends, aunts, and co-workers spring from the woodwork with sage advice from the ages. One common piece of advice is, "Let 'em cry it out when they're upset. If you pick 'em up and comfort 'em, they'll end up like rotten bananas: spoiled, for life!" But where does this theory come from? Is it grounded in thorough research? Or is it just one of those things that sounds right when others say it? The truth is, infants generally cry for a reason. They may be hungry, wet, or in pain. Contrary to popular "not-so wisdom," when we pick up and comfort very young children, they don't reason, "Ha, I have these people wrapped around my finger. I will make them do whatever I want." It's more likely, if we could read their little infant minds, they would be saying something like, "Ah, that's better. I feel safe and loved. This world must be an ok place." In our book, Love and Logic Magic for Early Childhood, we note that there’s no evidence to show that kids who are made to feel safe and loved when they are small grow to manipulate adults as they get older. Sadly, we do know of serious ill-effects from kids remaining in states where they feel hurt or scared for extended lengths of time. A baby with an unmet need cannot appreciate the message of self-sufficiency parents may try to send. Of course, as kids get older, they can learn to manipulate and throw fits to try and get their way. At the point when fits become obviously intentional, we can use other strategies (like moving away from the fit). But, when infants cry and rage (versus low-grade fussing), we can suppose there is a real need. Comfort them and don’t worry about “experts” who say you’re spoiling your baby. You’ll have plenty of chances to avoid spoiling her as she gets older. Are you going to settle down, or do you need to spend some time in your room? Can you use a quiet voice in here or would it be best for you eat outside so you can yell? Do you think you can play with that nicely, instead of hitting your brother with it? There's true power in the quiet voice! In my CD, Oh Great! What do I do Now?, I teach the importance of making discipline look easy, even when our kids are taking limit-testing to the limit. When we can handle things with a whisper, our kids begin to reason, "Wow! If mom handled me that easily, what else does she have up her sleeve?" Last week I whispered to my four-year-old, "You may keep the toys you pick up." That afternoon, I picked up the ones he left out, put them in the attic, and kept my mouth shut. Yesterday, I whispered the same thing, and he yelled, "No! I'll pick them up!" And he did! There is a tried and true psychological principle that says, "Notice something you don't like about your child, show some emotion, and the problem is guaranteed to get worse." Childhood swearing is a good example. Nowhere do we see this phenomenon more evident than when parents hear their little cherub utter one of the dreaded four-letter words. Many parents react with a variety of emotions ranging from shock, to out and out adult temper tantrums complete with threats. A normal child has to witness this parental display with utter fascination. "Wow. Look at my folks now. I haven't generated this much household excitement in a long time. I know exactly how to push their buttons. Television can't compete with this!" Many people believe some severe punishment for swearing will put an end to it. However, punishment doesn't work because the parent's attention is the ultimate reward. Punishment added to parental exasperation is intoxicating for the average kid. 1. Focus on the location of the word instead of the badness of the word. Talk with your kids about situations when these words are and are not acceptable. Consistently react to swearing with, "Is this the right place for that word? Thank you." Some effective parents say, "How sad. There's someone in your mirror who enjoys those words. Why don't you go to your room and have a talk with that person." 2. Use the Love and Logic® "Energy Drain" technique. "Oh, listening to words like that drains my energy. Give me a little while to think of some ways you can put that energy back in me." Say these words with the all the appropriate body language of a person who is becoming exhausted. Later say, "I think if you did some of my housework it might restore some of that energy I lost listening to your swearing. Thanks." This worked for one mom who told me about her 6-year-old son who brought home some bad language from school. She dramatically held her head, sat down, and said, "Energy Drain," each time he said one of those words. She was unable to do things for him until he had restored her energy by doing some of her chores. His swearing soon faded away. One day as she was driving him to school another driver cut her off. Before she could catch herself, she blasted the other driver with a few choice four-letter words. The moment those words slipped out, she realized her son was in the back seat hearing every word. As she looked in the rearview mirror, she saw his hand go to his head and heard him say, "Energy Drain." She was shocked. This wise mother stopped the car, looked at her wonderful son, and asked, "Do you think an ice-cream cone would put some energy back in you?" "Maybe," he sniffed. As they sat in the ice-cream shop he looked at his mom and, with the most drained expression, said, "Mom. You said three bad words. My energy was really drained. I think I'll feel better after two more ice cream cones." Using a few Love and Logic parenting techniques not only helps us raise better kids, but also trains our kids to be better parents when they grow up. Choices are magic. My grandson, Ferris, was bemoaning the amount of homework he had to do in kindergarten. Frankly, I think the kid had a point. What ever happened to childhood? Anyway, Ferris was sort of tripping over the line from protest into rebellion: "I'm just not going to do this homework. It's too much! I quit." My son put his hand on his child's shoulder and said, "I understand, Ferris. Just go in tomorrow and tell your teacher it was too much and that you decided to quit." And then my son and I walked off. About twenty minutes later we passed the dining room table again and Ferris was hard at work on his homework. It was almost completed. And my son, with a grin, said to me, "Dad, this Love and Logic stuff is just too easy." Big Kids Do It In the Potty...and Other Adventures! With some easy–to–learn tips from the Love and Logic Institute, parents can get their young children to brush their teeth, pick up their toys, use the potty, or just about anything else. How? I witnessed some clues, watching a three–year–old, picking up trash in a large auditorium. My audience had left for lunch. I stayed behind to marvel at this tiny dynamo. Toddling from isle to isle, he picked up empty coffee cups, gum wrappers, scraps of paper, and other refuse. How could such a small child be motivated to work so hard? The answer walked just a few steps ahead. There she was…his wonderful and wise grandma, smiling back at him as they worked together. Grandma volunteered in that auditorium almost every day, making it gleam for all to enjoy. Most days, little Cory came along to "help… for an hour or two. Grandma learned long ago that little kids want to be big like their parents. She also learned that little kids who have fun doing …big people chores… with their parents and grandparents grow into teenagers and adults who don't bicker and complain about helping around the house. Kids copy the people they love and respect. When parents show impatience, anger, or frustration because their little children are moving too slow or making mistakes, they destroy the natural love of helping. Kids copy people they view as caring yet strong. Parents who set firm–yet–loving limits have youngsters who become firm–yet–loving adults. While no one was handing Grandma goodies for tidying the room, she was smiling and saying things like, "This is so much fun! I love cleaning. It makes me feel so proud!" Grandma was rewarding herself, and her little grandson was soaking it up too. The key is to show your kids that you are always learning from your mistakes. Never underestimate the power of modeling. It worked, and it was easy. I just kept acting really excited when I went into the bathroom, and I kept telling him that he couldn't use the potty because …it was only for big boys…that big boys do it in the potty…and that using the potty is too much fun for little ones.… After about three weeks, I heard him screaming from the bathroom. There he was, singing and carrying on. I couldn't believe it! It's never too early to start having fun with Love and Logic! Lagging behind usually isn't a sign of toddler defiance. When you're not in a hurry, you'll probably notice that your toddler's held up because he's intensely examining a rock or spider web. Taking time for in-depth exploration is a good thing (he's curious!) and a great sign that your child is able to focus his attention on something for a long time (a big kid skill). By moving at a snail's pace while you're trying to zip along, your toddler is also gaining independence and following his own interests despite your, um, disinterest. don't really have a concept of time. When you can, dawdle with him. Ask about what he's interested in, which is also a great way to encourage his language skills. You can learn a lot about your toddler by following him on these explorations. What's more, he'll feel like you value and respect the individual he's becoming, which can prevent tantrums and other ploys for power. The reality is, you can't always go at your toddler's pace. Encourage him to move along by suggesting he hop to the door, the next line in the sidewalk, that tree, etc. You can also prepare him to leave his current activity by warning him five minutes before it's time to go: "Pretty soon, you'll need to be done with that. We're going to the store." To make scheduling less stressful for you and your toddler, build in time for his dawdling. And if all else fails, see it as a reminder to stop and smell the roses yourself. "Running away is very much a metaphor," says Tovah P. Klein, PhD, director of the Barnard College Center for Toddler Development. "The infant is attached to the parent, but once they get up and walking, they start to separate." And fast! While dawdling probably has nothing to do with you, you are a key player in the game of running away. (The game being, "I run and you catch me.") "The reason toddlers laugh when you swoop them up is their assumption that you'll be there to catch them," says Klein. Toddlers really have no sense that they might run too far to be caught. "When they run away, they're gleeful. They can't stop themselves—they're totally celebrating," says Klein. Indeed, the diaper-change-sprint (or "Get your shoes" dash) can be annoying. But giving in to your toddler's tests of power indoors is safe and developmentally appropriate. "You're granting them some of that need for control," says Klein. But when you're outside, it's time for limits. Let him know clearly that you hold his hand when you cross a street, or that when he's on the playground you need to be able to see him. If he runs away, be firm in telling him that it's not safe. "Inside, you're giving them some power: 'Sure you can run!' Outside, you give them the rule: 'You can't run away. We're keeping you safe,'" says Klein. Some kids might need to stay in the stroller if their staying power is too unpredictable. And what about "kid leashes," the kind that attach from a wrist band Mom or Dad wears to a tag or strap a toddler wears on her back? Klein believes they're disrespectful. "Leashing a child is a way to control a child without respecting who they are," she says. "It may have short-term benefit by keeping the child close, but over time I would think it makes her resentful," Klein says. As a child wearing a leash explores, she's being physically restrained: Klein ventures that must feel like punishment and does not help a child develop her own control, a process that takes time. Instead of leashing your child, help her learn to "tether" herself by having her hold your hand, or hold onto the stroller. "It does take time and lots of repetition," Klein says.